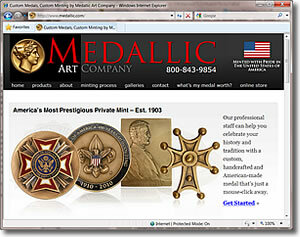 The world-famous Medallic Art Company announced today a new web site, www.medallic.com, designed to better display its 100+ years of minting excellence and to provide ready access for customers and art historians to numerous product categories, galleries, and historic slide presentations and custom minting information. The new www.medallic.com is intuitive, which lets a site visitor navigate with ease, letting visitors examine Medallic Art Company’s custom medals, institutional chains and maces, stock and collectible medals, specialty items, lapel pins, and spinning medals and plaques. The ten new galleries feature outstanding creations of renowned sculptors such as James Earle Fraser (the Buffalo Nickel), Victor David Brenner (the Lincoln cent), and Augustus Saint-Gaudens (the ‘double eagle" coin). Since its creation, great artists have always been affiliated with Medallic Art Company. The new website also provides a fascinating look at the entire minting process from concept to finished medallion, underscoring the complexity and artistry demanded of the sculptors, artists, die-makers, and production specialists in the creation of a fine work of art. Highlighted for visitors is the complete film, "The Medal Maker." First shown to the Society of Medalists in 1929, it features multi-award winning coin and medal designer, sculptor Laura Gardin Fraser in her famous New York Studio in 1929 creating the models for the Special Medal of Honor for the National Sculpture Society, America’s highest sculptural award. Every step of creation and production is shown, including sketching, preparing background plate, transferring the drawing and applying clay pellets to the model, foundry casting of the pattern, die making and striking the medal at Medallic Art Company. This exceptional movie is narrated by Elizabeth Jones, sculptor, and former United States Mint Chief Engraver, from her studio in Philadelphia. Medallic Art Company was formed in 1903 by Henry Weil, a highly respected French sculptor living in New York City. Through the years, the company has reproduced bas relief work of some of the most famous 20th century American sculptors, as well as many of the important medals and awards in the United States, including the Pulitzer Prize, Congressional Medal of Honor, National Medal of Science, President’s Medal for Freedom, the Newbery and Caldecott Medals, and the inaugural medals for 11 United States Presidents. Medallic Art grew in size and prestige in New York before moving to Danbury, CT in 1972. It relocated to Sioux Falls, SD in 1991 and to Dayton, NV in 1997. In 2009 Medallic Art Company came under the stewardship of Northwest Territorial Mint, which moved its minting operations to the Medallic facility in Dayton, NV. Northwest Territorial Mint was founded in 1984 and has produced and minted coins, commemorative medallions, knives and other products for corporate, governmental, military and private entities around the world. Its designs have commemorated events, honored champions and saluted achievements large and small, and its medallions have been bestowed as merit awards, retirement gifts and traded as souvenirs and collectors’ items. The retail showroom is located in Federal Way, Washington, where Northwest Territorial Mint also conducts its precious metals bullion business, being the largest independent mint in the United States. would like to see a catalog of Medallic Art issues to sort my collection .and to find out if there is a secondary market. I have a 1974 Star Trek Lives! medallion by Medallic Art Co. This one is made of .999 silver. I’ve never seen another. Would you have any information on this piece? Thanks!